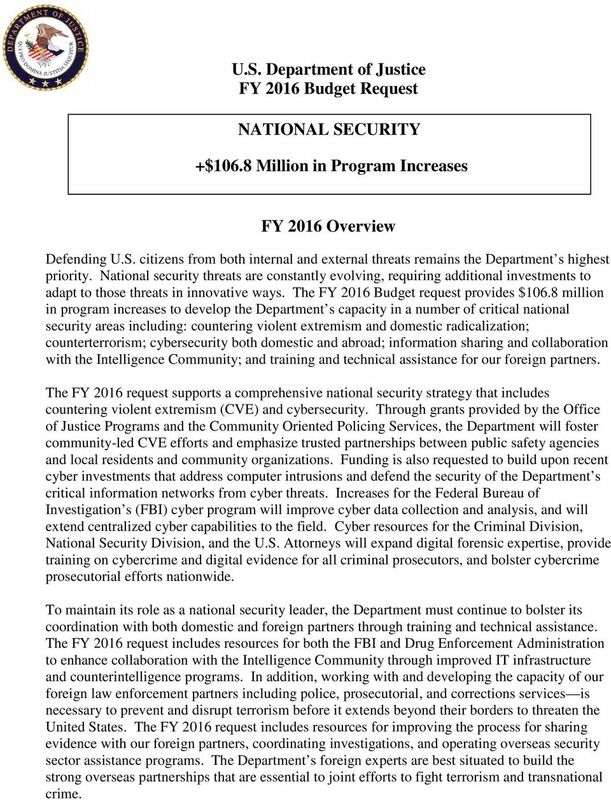 Download "U.S. Department of Justice FY 2016 Budget Request NATIONAL SECURITY. +$106.8 Million in Program Increases. FY 2016 Overview"
1 U.S. Department of Justice FY 2016 Budget Request NATIONAL SECURITY +$106.8 Million in Program Increases FY 2016 Overview Defending U.S. citizens from both internal and external threats remains the Department s highest priority. National security threats are constantly evolving, requiring additional investments to adapt to those threats in innovative ways. 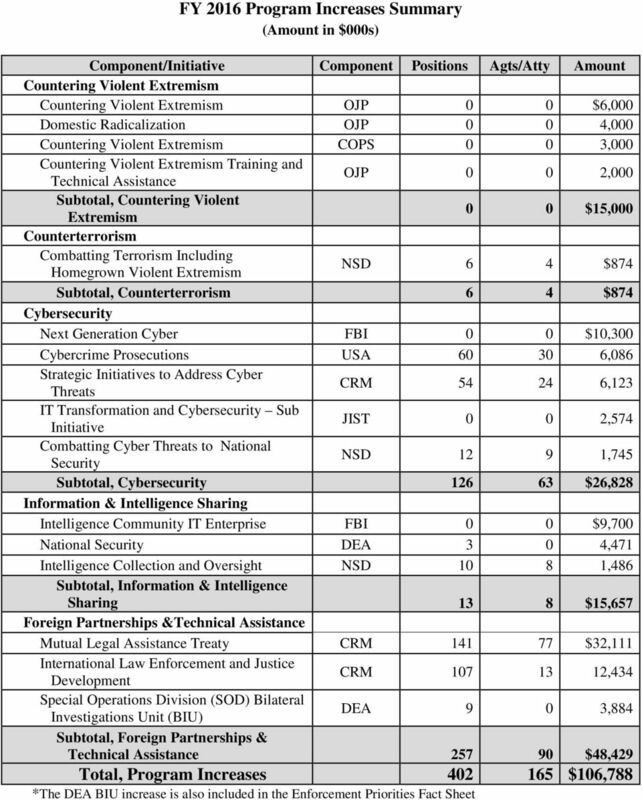 The FY 2016 Budget request provides $106.8 million in program increases to develop the Department s capacity in a number of critical national security areas including: countering violent extremism and domestic radicalization; counterterrorism; cybersecurity both domestic and abroad; information sharing and collaboration with the Intelligence Community; and training and technical assistance for our foreign partners. The FY 2016 request supports a comprehensive national security strategy that includes countering violent extremism (CVE) and cybersecurity. Through grants provided by the Office of Justice Programs and the Community Oriented Policing Services, the Department will foster community-led CVE efforts and emphasize trusted partnerships between public safety agencies and local residents and community organizations. Funding is also requested to build upon recent cyber investments that address computer intrusions and defend the security of the Department s critical information networks from cyber threats. Increases for the Federal Bureau of Investigation s (FBI) cyber program will improve cyber data collection and analysis, and will extend centralized cyber capabilities to the field. Cyber resources for the Criminal Division, National Security Division, and the U.S. Attorneys will expand digital forensic expertise, provide training on cybercrime and digital evidence for all criminal prosecutors, and bolster cybercrime prosecutorial efforts nationwide. To maintain its role as a national security leader, the Department must continue to bolster its coordination with both domestic and foreign partners through training and technical assistance. The FY 2016 request includes resources for both the FBI and Drug Enforcement Administration to enhance collaboration with the Intelligence Community through improved IT infrastructure and counterintelligence programs. In addition, working with and developing the capacity of our foreign law enforcement partners including police, prosecutorial, and corrections services is necessary to prevent and disrupt terrorism before it extends beyond their borders to threaten the United States. The FY 2016 request includes resources for improving the process for sharing evidence with our foreign partners, coordinating investigations, and operating overseas security sector assistance programs. The Department s foreign experts are best situated to build the strong overseas partnerships that are essential to joint efforts to fight terrorism and transnational crime. 2 FY 2016 Program Increases The Department requests a total of $106.8 million in program increases to address five critical national security areas: Countering Violent Extremism Office of Justice Programs (OJP) Countering Violent Extremism (CVE) Grant Program: $6.0 million The requested resources will create a new grant program that would provide community organizations funding to support flexible, locally-developed, community-led CVE models. The suggested approach emphasizes close coordination with federal partners, knowledge building, and model development by requiring an action research component, technical assistance, and program assessment. There are no current services for this initiative. Domestic Radicalization Research: $4.0 million Funding is requested to conduct research to identify causes of violent extremism and related phenomena and advance evidence-based strategies for effective prevention and intervention. The request establishes this research program as a separate line-item. There are no current services for this initiative. Community Oriented Policing Services (COPS) Countering Violent Extremism: $3.0 million Funding will be awarded to enhance the ability of law enforcement agencies nationwide to partner with local residents, community groups, and other stakeholders on homeland security initiatives by leveraging established community policing approaches to counter violent extremism through multiple demonstration projects. Additionally, this program will fund a single award for coordination, evaluation, and technical assistance efforts across the funded demonstration sites. 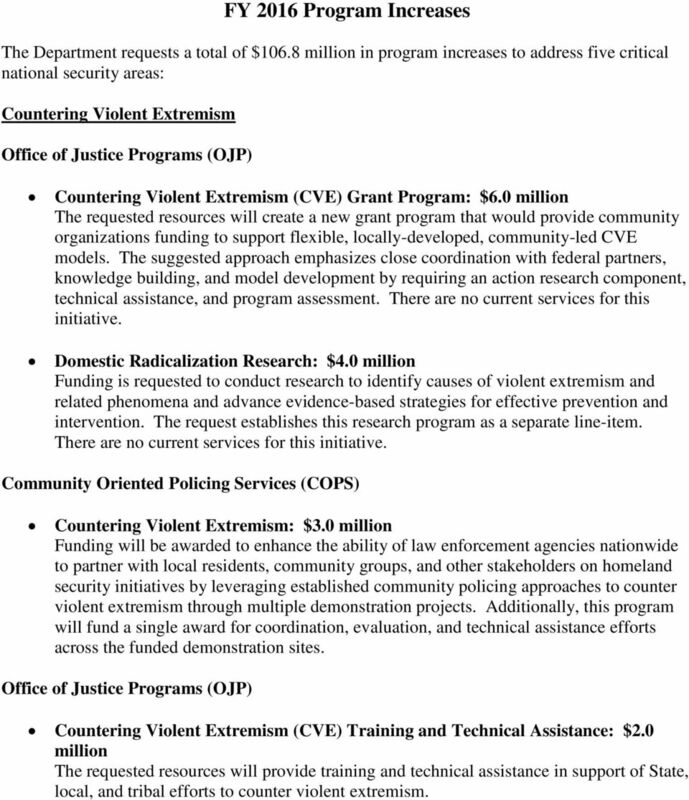 Office of Justice Programs (OJP) Countering Violent Extremism (CVE) Training and Technical Assistance: $2.0 million The requested resources will provide training and technical assistance in support of State, local, and tribal efforts to counter violent extremism. 3 Counterterrorism National Security Division (NSD) Combating Terrorism Including Homegrown Violent Extremism: $874,000 and 6 positions (4 attorneys) This enhancement will support NSD's investigative and prosecutorial efforts to combat increasing terrorist threats against the United States and its citizens, including from Homegrown Violent Extremists. FY 2016 current services for this program are 57 positions (47 attorneys) and $12.9 million. Cybersecurity Federal Bureau of Investigation (FBI) Next Generation Cyber: $10.3 million (non-personnel) The requested funding will support the Next Generation Cyber initiative and will improve cyber collection and analysis and extend centralized cyber capabilities to the field. The FY 2016 current services for this initiative are 1,754 positions (894 agents) and $473.1 million. 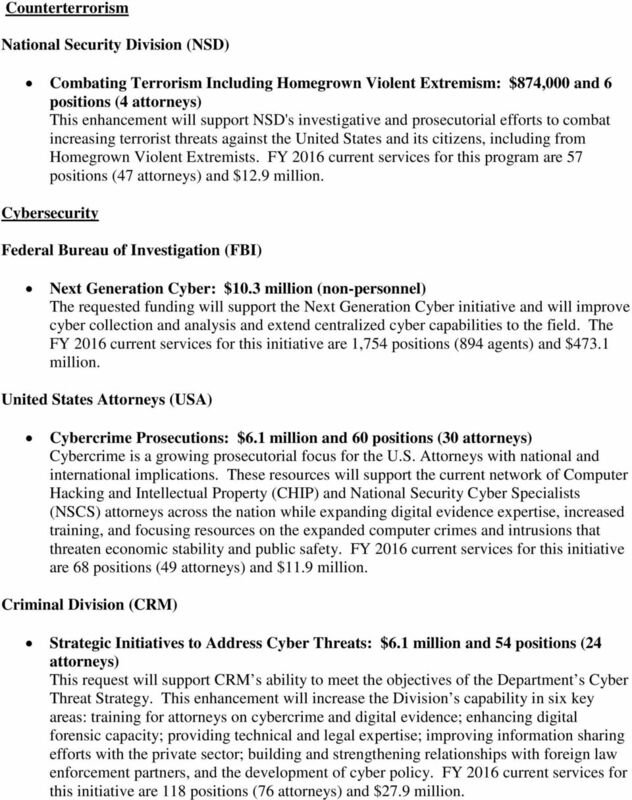 United States Attorneys (USA) Cybercrime Prosecutions: $6.1 million and 60 positions (30 attorneys) Cybercrime is a growing prosecutorial focus for the U.S. Attorneys with national and international implications. These resources will support the current network of Computer Hacking and Intellectual Property (CHIP) and National Security Cyber Specialists (NSCS) attorneys across the nation while expanding digital evidence expertise, increased training, and focusing resources on the expanded computer crimes and intrusions that threaten economic stability and public safety. FY 2016 current services for this initiative are 68 positions (49 attorneys) and $11.9 million. Criminal Division (CRM) Strategic Initiatives to Address Cyber Threats: $6.1 million and 54 positions (24 attorneys) This request will support CRM s ability to meet the objectives of the Department s Cyber Threat Strategy. This enhancement will increase the Division s capability in six key areas: training for attorneys on cybercrime and digital evidence; enhancing digital forensic capacity; providing technical and legal expertise; improving information sharing efforts with the private sector; building and strengthening relationships with foreign law enforcement partners, and the development of cyber policy. FY 2016 current services for this initiative are 118 positions (76 attorneys) and $27.9 million. 4 Justice Information Sharing Technology (JIST) IT Transformation and Cybersecurity Initiative: $2.6 million (non-personnel) The request provides funding for the acquisition of cybersecurity tools, such as advanced persistent threat or insider threat detection tools. The FY 2016 current services for this initiative are $725,000 and five positions. 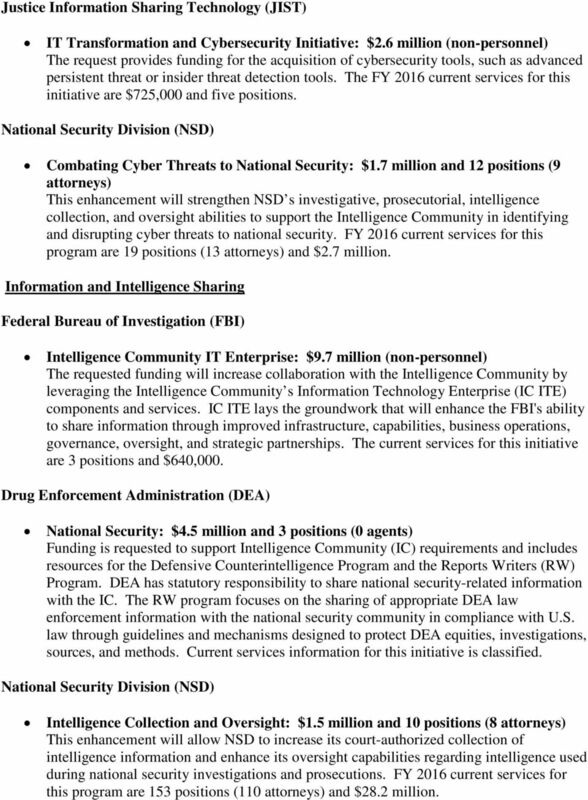 National Security Division (NSD) Combating Cyber Threats to National Security: $1.7 million and 12 positions (9 attorneys) This enhancement will strengthen NSD s investigative, prosecutorial, intelligence collection, and oversight abilities to support the Intelligence Community in identifying and disrupting cyber threats to national security. FY 2016 current services for this program are 19 positions (13 attorneys) and $2.7 million. Information and Intelligence Sharing Federal Bureau of Investigation (FBI) Intelligence Community IT Enterprise: $9.7 million (non-personnel) The requested funding will increase collaboration with the Intelligence Community by leveraging the Intelligence Community s Information Technology Enterprise (IC ITE) components and services. IC ITE lays the groundwork that will enhance the FBI's ability to share information through improved infrastructure, capabilities, business operations, governance, oversight, and strategic partnerships. The current services for this initiative are 3 positions and $640,000. 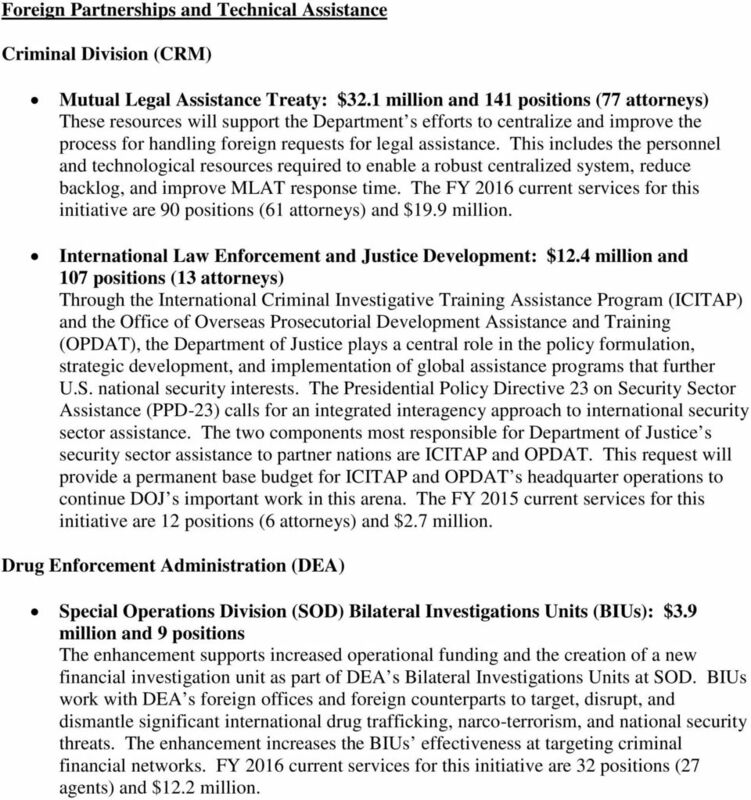 Drug Enforcement Administration (DEA) National Security: $4.5 million and 3 positions (0 agents) Funding is requested to support Intelligence Community (IC) requirements and includes resources for the Defensive Counterintelligence Program and the Reports Writers (RW) Program. DEA has statutory responsibility to share national security-related information with the IC. The RW program focuses on the sharing of appropriate DEA law enforcement information with the national security community in compliance with U.S. law through guidelines and mechanisms designed to protect DEA equities, investigations, sources, and methods. Current services information for this initiative is classified. National Security Division (NSD) Intelligence Collection and Oversight: $1.5 million and 10 positions (8 attorneys) This enhancement will allow NSD to increase its court-authorized collection of intelligence information and enhance its oversight capabilities regarding intelligence used during national security investigations and prosecutions. FY 2016 current services for this program are 153 positions (110 attorneys) and $28.2 million. 5 Foreign Partnerships and Technical Assistance Criminal Division (CRM) Mutual Legal Assistance Treaty: $32.1 million and 141 positions (77 attorneys) These resources will support the Department s efforts to centralize and improve the process for handling foreign requests for legal assistance. This includes the personnel and technological resources required to enable a robust centralized system, reduce backlog, and improve MLAT response time. The FY 2016 current services for this initiative are 90 positions (61 attorneys) and $19.9 million. International Law Enforcement and Justice Development: $12.4 million and 107 positions (13 attorneys) Through the International Criminal Investigative Training Assistance Program (ICITAP) and the Office of Overseas Prosecutorial Development Assistance and Training (OPDAT), the Department of Justice plays a central role in the policy formulation, strategic development, and implementation of global assistance programs that further U.S. national security interests. The Presidential Policy Directive 23 on Security Sector Assistance (PPD-23) calls for an integrated interagency approach to international security sector assistance. The two components most responsible for Department of Justice s security sector assistance to partner nations are ICITAP and OPDAT. This request will provide a permanent base budget for ICITAP and OPDAT s headquarter operations to continue DOJ s important work in this arena. The FY 2015 current services for this initiative are 12 positions (6 attorneys) and $2.7 million. Drug Enforcement Administration (DEA) Special Operations Division (SOD) Bilateral Investigations Units (BIUs): $3.9 million and 9 positions The enhancement supports increased operational funding and the creation of a new financial investigation unit as part of DEA s Bilateral Investigations Units at SOD. BIUs work with DEA s foreign offices and foreign counterparts to target, disrupt, and dismantle significant international drug trafficking, narco-terrorism, and national security threats. The enhancement increases the BIUs effectiveness at targeting criminal financial networks. FY 2016 current services for this initiative are 32 positions (27 agents) and $12.2 million. DECLARATION STRENGTHENING CYBER-SECURITY IN THE AMERICAS INTER-AMERICAN COMMITTEE AGAINST TERRORISM (CICTE) TWELFTH REGULAR SESSION OEA/Ser.L/X.2.12 7 March, 2012 CICTE/DEC.1/12 rev. 1 Washington, D.C.
2. Taking into account the developments in the next five years, which are the actions to be launched at the EU level? TEXAS HOMELAND SECURITY STRATEGIC PLAN 2015-2020: PRIORITY ACTIONS INTRODUCTION The purpose of this document is to list the aligned with each in the Texas Homeland Security Strategic Plan 2015-2020 (THSSP). 28 USC 532. NB: This unofficial compilation of the U.S. Code is current as of Jan. 4, 2012 (see http://www.law.cornell.edu/uscode/uscprint.html). The Senior Executive s Role in Cybersecurity. By: Andrew Serwin and Ron Plesco. Keynote: FBI Wednesday, February 4 noon 1:10 p.m.
U.S. Department of Justice FY 2014 Budget Request STATE, LOCAL AND TRIBAL LAW ENFORCEMENT. +$741.4 million in Program Increases.